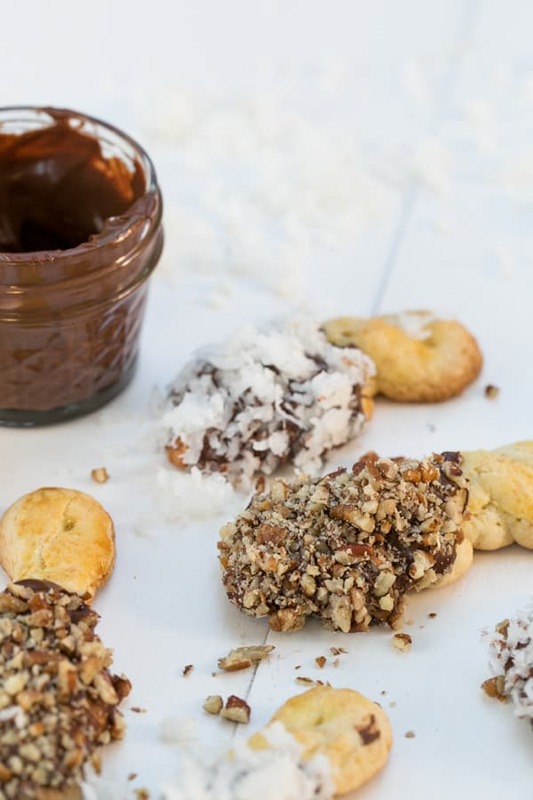 Yes, these are the best butter twist cookies ever! They’re SO delicious! It’s an old Italian recipe that’s been passed down a few generations from my husband’s grandmother who got it from her mother who was an immigrant from Italy. They were made and cherished every Christmas. My mother-in-law was a little hesitant to give out the recipe, but I convinced her it was for the good of the world to have this recipe, haha! 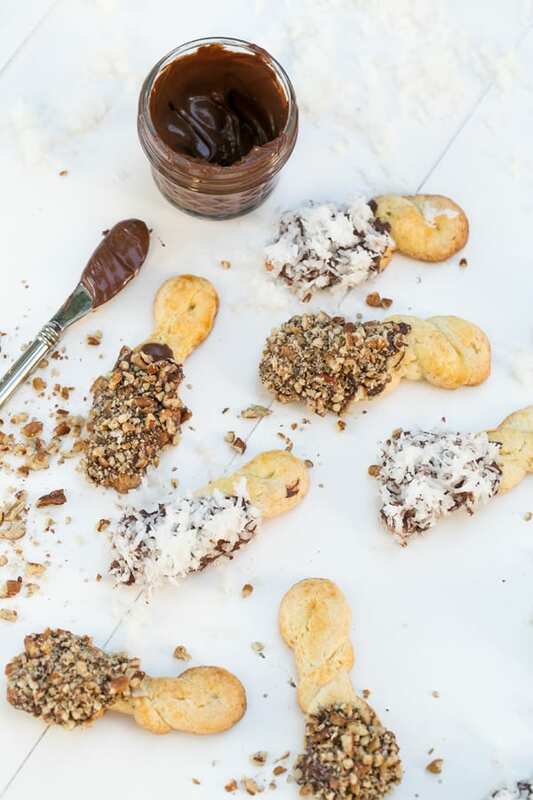 These Christmas twisty cookies are buttery, flakey, dipped in chocolate, coconut and pecans… and pretty much HEAVEN. For me, they’re dangerous because I can literally sit down and eat 10 of them. These are the type of cookies that will go on my “must bake every year” cookie list. And I’m happy to carry on the tradition for my family. Enjoy!! In a stand alone mixer cream together the sugar, eggs and butter. On a floured surface, break off pieces of dough and roll into pencil thick ropes (about 12″ long). Cut into 6″ pieces, fold in half and twist. Put onto a lightly greased sheet and brush with egg. Bake at 350 for about 18 minutes or until a lightly golden brown. 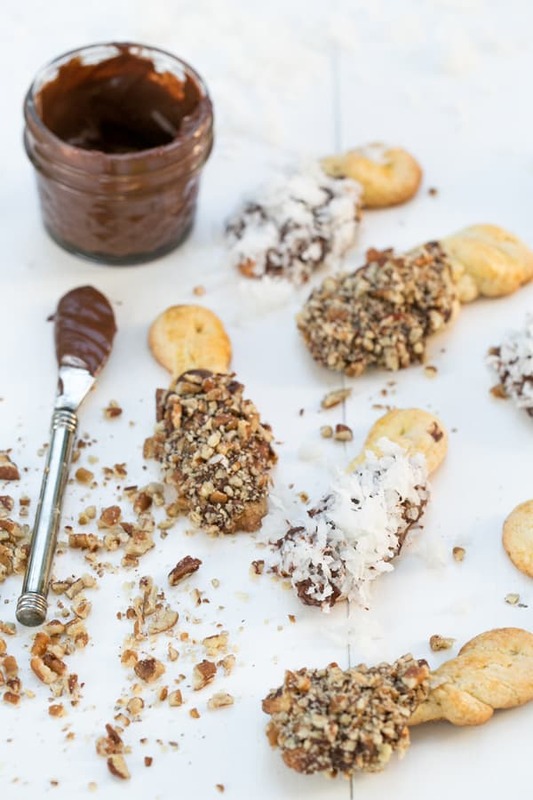 Cool and dip into melted chocolate and crushed pecans or coconut! Lay on parchment paper to dry. ENJOY! These are so cute and fantastic, I would have to eat AT LEAST half of them before giving any away!